If an aluminum screen door is already rust-proof, why have a powder coat finish? It may seem like overkill to most screen door manufacturers to go the extra step and have a powder coat finish on an already rust resistant aluminum screen door. That is why many don't do it. It is like buying gum, if the gum lasts forever, you won't buy any more. So manufacturers of screen doors (and gum) want to make sure that it lasts, but only for so long. Their bottom line depends on it. What are the advantages (and disadvantages) of a powder coat finish versus the tradtional paint finish? Why does it matter? 3 Reasons to Ask for a Powder Coat Finish on your next aluminum screen door. It is safer for the environment. A powder coat finish use no solvents that create harmful amounts of VOC. The process itself is cleaner as well because the exhaust air from the plant can be returned to the plant and not to the environment. Plus the heating and cooling costs for the process are less. It looks better for longer. 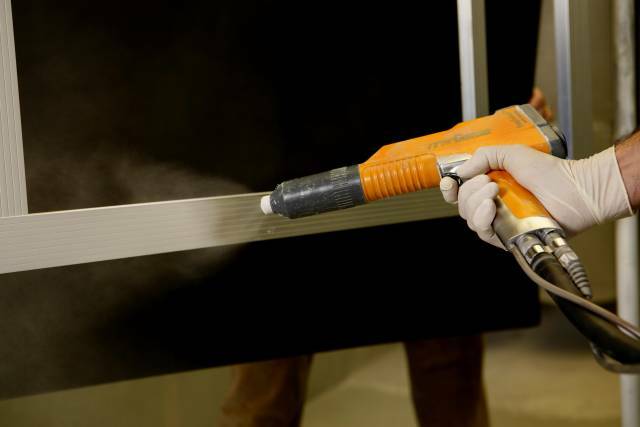 The alternative to a powder coat finish is sprayed paint which chips easier, fades faster, and cracks more often. More colors for decorative screen options. Most screen doors come in white, and if you are lucky black or almond. You can get a custom matched color (if you want to pay more and wait longer), or choose from 5 custom standard colors. What could go wrong with a powder coat finish? A powder coated finish for decorative screen doors is only as good as the pre-treatment process. A 4 stage process is best, (1) clean, (2) rinse, (3) 2nd rinse, and the (3) etch (the etch stage roughs up the surface of the aluminum so that the powder sticks or grips more effectively). Salt spray testing is one way to determine how well your coating is holding up. A corrosion resistant test simulates the affect of salt air on the finish and how long it will last before the surface shows any signs of breakdown. Wet based paints last around 600 hours. Powder coating generally exceeds 1000 hours even with a 3 stage pre-treatment process (clean, rinse, etch). The longer the better for anybody wanting a finish that will hold up. Why do I mention this? Because with PCA's manufacturing process we are exceeding 2500 hours. Is durability and design important for the screen door on your home? Or for your customer that demands quality in all things, especially a screen door? Build your custom screen enclosure now, and know that it will last (at least) a lifetime.